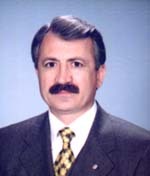 H. Zeki Buyukyildiz, M.D., Assoc. Prof.
March 1953 : Born in Safranbolu (Karabuk, Turkey). June 1970 : Graduation from Pertevniyal High School. June 1976 : Diploma of Doctor in Medecine awarded. appointed to the Medico-Social Center of University of Istanbul. Aug. 1980 - Jan.1982 : Completed his military service as an Ophthalmologist. Feb. 1982 - April 1983 : Worked as a private ophthalmologist. April 1983 : Senior registrar in Haseki (State) Hospital Eye Clinic. May 1986 : Vice - Chief in Haseki Hospital Eye Clinic. Feb. And March 1986 : Joined to the works of Argon laser traetment in St.
Mary's Hospital in Colchester city of England. Hospital in Cambridge for two weeks. Faculty of Medecine, University of Istanbul. Ophthalmology Society for two years. Oct. 1990 : Became Associate Professor. duty of the Chief in Haseki Hospital Eye Clinic for 11 months. examinations of Dr. J.R. Shepherd in Shepherd Eye Center in Las Vegas. He attended many of the ophthalmology congresses, courses, symposia aand other scientific meetings arranged every year in Turkey since 1977. He presented papers in many of them. In abroad, he attended various congresses and symposia in United States, Netherland, England, Singapore, Cyprus, Sarajevo, Greece and Egypt. He has 46 scientific papers and articles. He mainly works on Excimer and otherkind of laser applications and surgeries, and retinal detachment surgery. In addition to his professional work, he plays "Bağlama" (Turkish folkloric instrument) and sings folk songs. He worked as the Chairman of Istanbul University Turkish Folk Music Band, that he is a founder of it, for 20 years. He has various folk songs compilations and a wide archive of Turkish Folk Music. Dr. Buyukyildiz, besides, graduated from University of Istanbul, Press and Publications School, Journalism and Public Relations Department in 1983.